This past year I learned the importance of setting respectful boundaries and to never let other people put me in a state of waiting. Patience is a virtue and yet life is short. We only have so many days on this planet make a positive impact during our lifetime. This is what is known as our LEGACY and it is a gift that we pass on to our children. I’m am now moving forward with fast momentum and renewed enthusiasm as exciting opportunities are being offered to me for the coming year. As many of you already know, I am writing a book. I am going to be the official photographer for my first yoga retreat in Sayulita, Mexico March 24 - 30. I’ve also been invited to visit Antartica, Australia and France. What I am most excited about, however, are the new projects with incredibly talented friends in Seattle that are in the works, including yoga instructional videos in English and in Spanish. This has been a dream of mine for years and finally everything is coming together to make this dream come true. So why is this the year of truth? There has been a pattern of truths that have slowly been leaking out in our society over the past few years. Much of it started with the #metoo movement, but in 2019 we are going to see a flood of new revelations about government, corporations, media organization and outer space. We will also receive revelations about our own personal lives that will change the fabric of our realities for the better. I don’t want to go into politics because speaking about our political systems has become a Tower of Babel by design. Certain words and names these days have become triggers that make us close our minds, exchange insults and turn away. This year, however, we will be shown truths and evidence that is so undeniable that we will no longer be able ignore them. Some will be very shocking and they will shake the foundation of our belief systems, but this is all very necessary. If we want to change the world, we must start by changing ourselves. Just as the light of truth is being shined upon the shadows of our institutions, it is also important to shine this light into our own shadows and face the parts of ourselves that we do not like. Fear and ego have controlled so many of us for much of our lives, but 2019 will be the perfect year to free ourselves from the shadows that have been holding us back so that we can finally pursue the passions of our hearts. 1. What makes me happy? 2. What makes me sad and needs to be released? 3. What are the dreams that I have been putting off? 4. What are the limiting beliefs that are holding me back from pursuing my dreams? 5. What are the fears that are keeping me from the love that I desire? A pastor once said to me, “When we name our demons, we cast them out.” Please take time to ponder these questions, to forgive yourself and others, and to cast out your metaphorical demons. Then take time to write down a beautiful vision for your life for 2019. I released so much in 2018 and I really learned how to love and appreciate myself. As a result, God/The Universe has been placing talented people and amazing new opportunities into my life over the past two months to help me achieve the dreams that I’ve envisioned for the coming year. To get to this position of manifesting what I desire, I had to forgive myself, as well as others. Doing this self work has brought me to a place of peace and reconciliation. Remember that we cannot manifest goodness when we carry bitterness in our hearts. Only love and positivity will attract the magic and the miracles that we desire. Take a moment to watch this inspiring video. By reading this blog you have shown that you also want to become the best version of yourself and I am here to help you. As a community of positive people we can support and inspire one another along this incredible journey. Yes, there will be obstacles that we will encounter along the way. Just remember that they were put there to make us stronger. 2019 will undoubtedly have its ups and downs, but never let anyone or anything make you fearful. Release fear and ego, and practice responding to life and to others from a place of love. This will be a year of facing our own truths and illusions like never before. This is very important because the truth is necessary to set us free so that we can become the highest greatest versions of ourselves. Wishing you many blessing and so much love for this coming new year! P.S. - Thanks so much for being a part of the Total Soulful Journey community. I am so excited to bring you a diverse offering of new and inspiring content this year! If you found value in this blog post, please click on the “heart” button below. 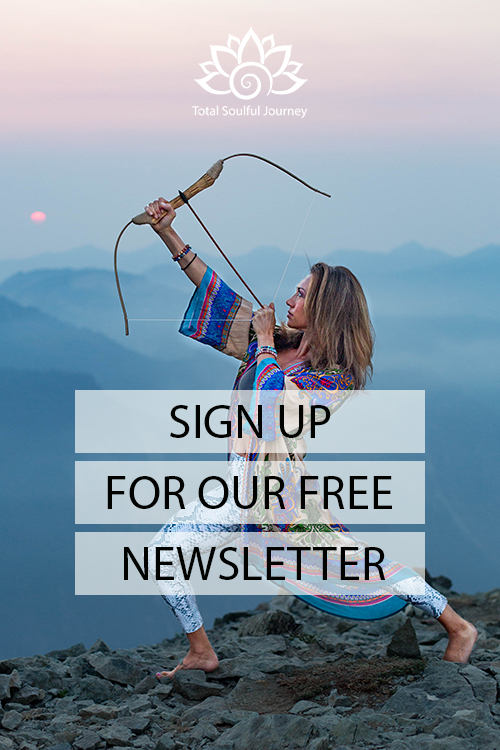 I also invite you to scroll down to the form below to sign up for our free newsletter (the form is on the side if you are on a desktop computer).